Lakefront Dillon Condominium-Incredible Location! Free Wi-Fi! 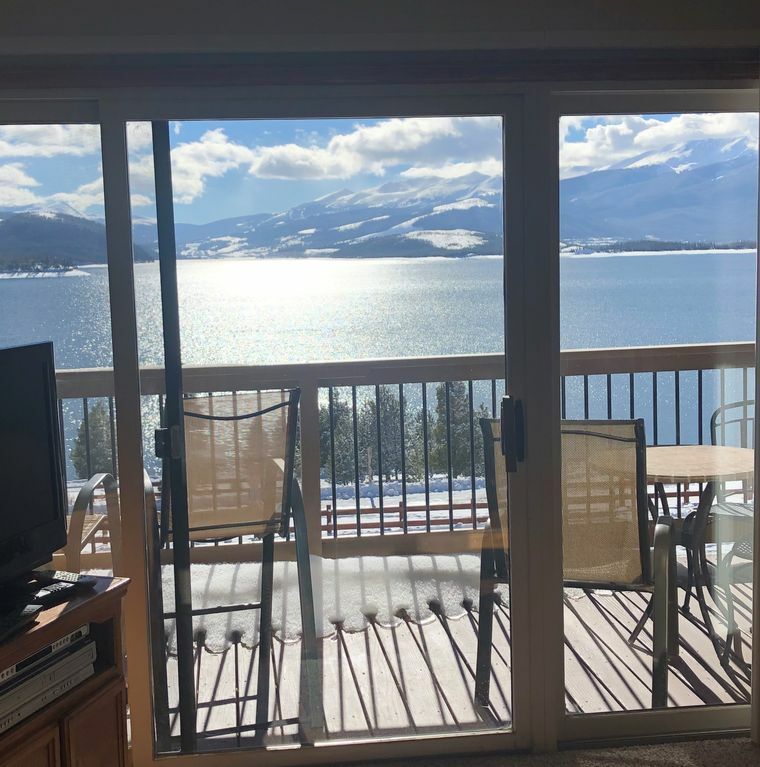 Our Coeur Du Lac condominium is located right on the shores of Lake Dillon. The unit is on the top floor so the views of the lake and mountains are breathtaking! Enjoy your coffee or hot chocolate on the deck overlooking it all! Come and enjoy the mountain feel of our remodeled unit with a stone, wood-burning fireplace, and beautiful carved log furniture in both bedrooms. There is a queen-size bed in the master bedroom, two twins in the second bedroom, and a queen-size sofa sleeper in the living room. We have a selection of videos, games, books and puzzles for the entire family to enjoy! Dillon is centrally located to all activities in the Summit County area, both summer and winter. The outlet shops of Silverthorne are within walking distance or a short drive. In the winter, you are centrally located to five major ski areas: Breckenridge, Keystone, Arapaho Basin, Copper Mountain, and Vail. Along with skiing, these areas offer a variety of activities including snowmobiling, cross-country skiing, snowshoeing, and dog-sled rides. The Summit Stage Shuttle stop is a block away and provides FREE transportation to the ski areas. In the summer, the bike and walking paths are directly behind the complex. Our complex as a new, beautiful, outdoor pool/hot tub area. The amphitheater, just a five-minute walk, offers FREE concerts, farmers' markets, plays, and other activities. Next to the amphitheater is a beautiful park which has a new playground area for the kids. The marina is also close by. Summer in the Colorado Rockies offers fishing, hiking, biking, white-water rafting, and jeeping. Again, our Dillon condominium is centrally located to all these activities. Dillon offers a 'small town' feel yet at the same time, offers all the amenities of a resort town including great shopping, restaurants, movie theatres, bowling, and a great recreation center. LET OUR CONDOMINIUM BE YOUR HOME-AWAY-FROM-HOME FOR YOUR COLORADO GETAWAY! WE ALSO HAVE LISTING #355551, ANOTHER 3RD FLOOR UNIT AT COEUR DU LAC SO WE CAN ACCOMODATE LARGER GROUPS BETWEEN BOTH UNITS. Sorry, no pets or smoking, please. The condo was exactly as advertised and we had a great stay. In fact, we will stay again should it be available. overall very good stay. Beautiful view out over the lake and mountains. Very well organized. Nice accommodations. Only suggestion is for owner to leave instructions on how to use the television and DVD's. Several remotes and we had to call to figure same out. Otherwise very nice stay and terrific location to all ski locations. The condo is in a nice location and the view is great but it was really dirty. The place could use a really good cleaning and it needs new towels and sheets. The bathroom had hair all over the floor. The sheets and towels were stained . It had not been cleaned. Very disappointing, the condo is very cute and the view is awesome. We are very sorry to hear about your experience with the cleanliness of our property. We take pride in our properties and put the highest priority on having our units clean and welcoming to our guests. We usually get compliments on how clean our units are and replace linens regularly. We appreciate your feedback and will contact our cleaning service about your concerns and have them corrected immediately. Great Location and great layout. Very comfortable inside with everything you need in the kitchens, bathrooms, and bedrooms. A very nice gift basket waited for us and we had everything we needed in the condo. The location is perfect and the views over the lake were just amazing. We plan to stay at this condo next year! Great location and perfect for a family. Great location next to main roads, restaurants and shopping. View of Lake Dillon was a nice way to wake up each morning. Twin beds in second bedroom were perfect for our boys. Enjoyed our stay while on a family ski trip. Amy was very helpful and responded to emails quickly. Thanks so much for your nice review. We're glad you enjoyed your stay! If you are looking for a great view of Dillon lake this condo is superb. The close proximity to Frisco and Breckenridge makes this place wonderful. The owner definitely knows how to stock the property with everything needed for a comfortable stay. Will Definitely stay again! Thanks so much! We really appreciate your great review! Rates are subject to change until reservation is confirmed. Higher rates may apply during holiday weeks/weekends. 3 night minimum may be required for weekends during peak seasons. Lower rates may apply to longer stays and "last minute" reservations.